I think you're reading is clearly the correct one. Even the "cliffhanger" gives it away. "What will Ruka do with these feelings now that they're all alone!?" She's obviously going to push him away, gently. During the whole date she's the one who's looking very introspective and keeping some emotional distance. 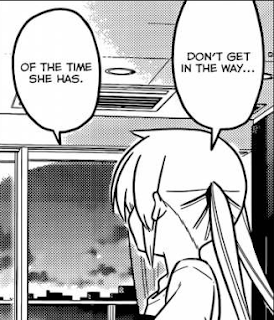 One thing that struck me about Nagi's attitude this chapter is how similar it is to the end of the Mykonos arc. 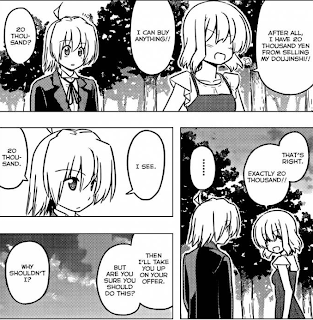 Everyone else goofing off, while Nagi sits quietly waiting for Hayate to come back. Even Hamster's role of being the well-meaning but oblivious one is the same. 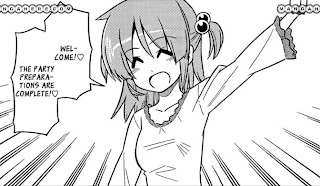 Like the ending of that arc, I think the next chapter or two will be good ones for Nagi fans. Heh, thanks. Another thing that supports the "mask/facade" theory is that Ruka specifically mentions that she lost because of the mask that Isumi gave her to hide her identity in the previous chapter. She was probably partially serious, but was also referring to a different kind of mask. I hope you're right about the next chapters. Most people seem pretty disappointed that Athena hasn't made her return yet. 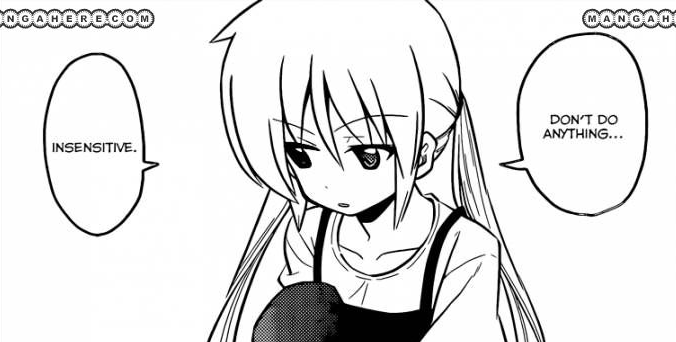 Throughout this arc though, we still haven't seen how Hayate feels about the whole matter - which I think is something that I'd really like to see personally before Ruka becomes permanently relegated to side/support character status. I do hope we get some sort of reaction from Hayate out of this. Getting a real look at his feelings is a rare thing and I think an arc this long deserves that kind of tidbit. 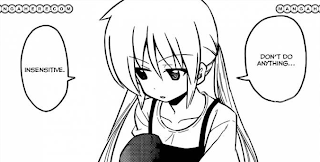 If the last few episodes of cuties is to be thought of as canon, then it is most likely Ruka still has some lingering feelings at the very least for Hayate. Whether these feeling are going to be more outgoing, or kept hidden is yet to be known. 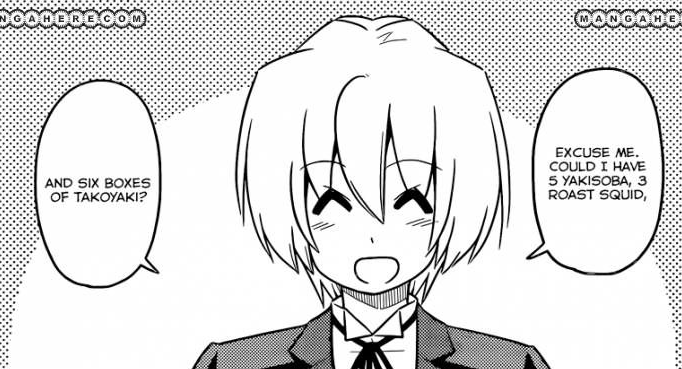 I'm also curious for where this will go next, and if it's going to be going to be about Hayate's brother, or something else entirely. 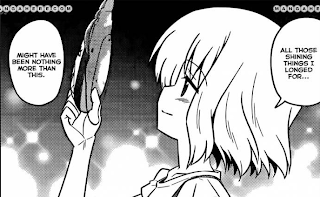 There are still a lot of plot threads that need to be dealt with, such as Machinas appearance in Sakuya's yard, the mysterious girl with the picture of Himigami, and thats just leaving out the possibliity of something new coming out. If Hata plans to properly wrap up all of these parts, it's going to take quite a bit. And I do like Nagis character progression a lot, but she's hardly the only character who's gotten progression. For example, the hamster. Compare her from when she was introduced to now. The way she acts has completely changed from then. She has become a braver and more outgoing person, not unlike Nagi's change. Hamster is just a consistently great character. She gets overlooked a lot but I smile whenever she appears. Isumi is another character who's on about that same level of being always entertaining even though she doesn't drive discussion. I think we will get focus on Ikusa relatively soon because its all tied together with Athena's story. Probably a good stretch of filler between the end of this arc and start of the next one, though. Hey guyz, dun forget that Maria is probably sulking and everyone will discover that she ran away from home when they eventually get back to the Violet Mansion. Purely wild speculation here. It just came to mind as I was watching Animax's rerun of CTMEOY (dubbed in English). Trying to upload the episode to dailymotion right now, but the uploader keeps failing on me.